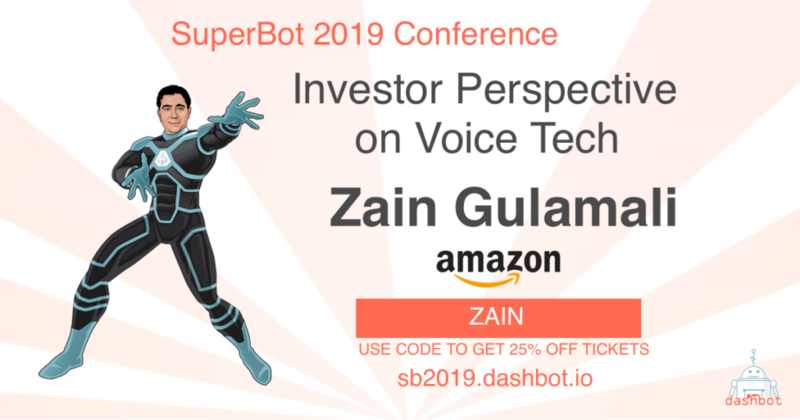 Venture capitalist and investor Zain Gulamali will share his perspective as an investor in the voice space at SuperBot 2019, the premier voice and chatbot conference. Zain is a venture capital and growth equity investor with 12 years of experience in consumer and enterprise technology investing, M&A, strategy, and business development in mobile and consumer sectors. He is currently at the Amazon Alexa Fund as an investor in early-stage to growth equity companies. Previously, He was a top-ranked Investment Banking Analyst for Global Natural Resources and Industrials at Goldman Sachs. He then moved on to Pocket Gems, where he was the Director for Strategy, Finance, and Partnerships. Zain received his BS in Computer Science and Media Studies at MIT, where he was a Project Management Institute (PMI) Scholar. He also received his MS in Management as a MSx/Sloan Fellow at the Stanford Graduate School of Business.